"Leave your brain in your drop bag" - Rich Cranswick with probably the best advice for this race. Continuing from Pewsey [read part 1 here] after James had left and a couple of things I forgot yesterday. Jackie had dropped at the 35 mile point looking quite crippled. She was so keen on doing this but had an illness in the weeks leading up to to and was not in good shape. She got a ride to Pewsey with Justin and was hobbling around pretty bad. Chatting with Lee and Andrew was great. Lee has a nice collection of funny stories from the forces and I'd be lying if I said it wasn't giving me some more race ideas. This race mirrors in some way the training you can get in the army where you are just made to work and work with no idea when it will end. Those that do not drop are the ones who are selected. Once Dave had gone through just before midnight it was time for me to head to Woolhampton which was about 30 miles along. The next CP these guys would see was near Hungerford and most of them will go through there as the pubs are kicking out. My good friends Jany and Rob were stationed at this checkpoint. I feel a bit bad that I asked them to help and then said "yeah just drive to this bridge in the middle of nowhere and make tea randomly for about 10 hours in the dark. They were brilliant though and Drew and Claire had taken all the stuff over to them and then later Paul Ali and Paul Stout had come along to help out and it was really appreciated that they did. 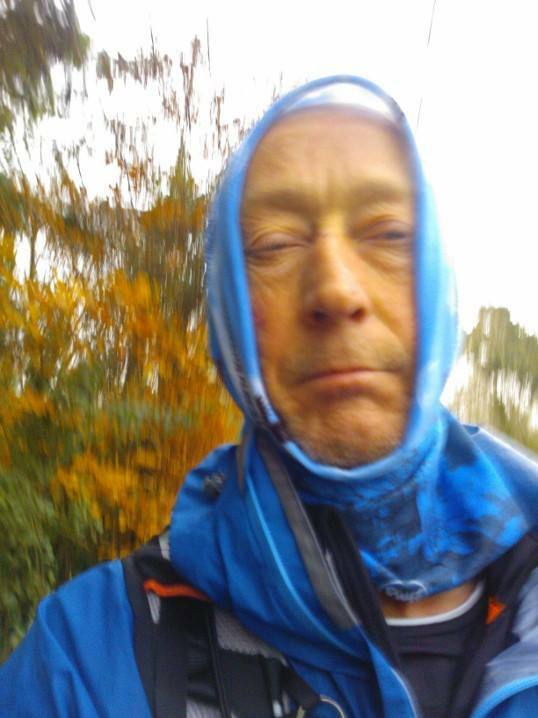 It was about 2am where I met up with Duncan who I had only really met before when running, which meant I did not recognise him without being covered in water carrying devices. We were gathered outside a pub with Dave, Paul and Paul and awaiting news from Hungerford where Jany and Rob were still stationed. Jany then texted to say they were low on water so we had to drive out there to take some. It was lucky that Paul Ali was there with a car to do this. I have recently passed my driving test but have never driven on my own before and am terrified of doing so. It was great to see Jany and Rob who ust have looked odd hanging around the arse end of an industrial estate at gone midnight. Such are the hazards of crewing for these kinds of events. I often think that it is best in these situations just to pretend you are dealing drugs or dogging as it tends to generate less questions. By the time we got back to Woolhampton which was about the 80 mile point Tim had been and gone. He was making great time having done that 80 in around 16 hours which was good going. The route we picked was quite fast and I was pleased that runners could run at a decent pace. This canal would be ideal for a fast 100 mile race should someone like to organise one. You could start on that bike track near Bristol where it is fairly wide, 12 miles of that then by the time the runners spread out a bit you are on a nice canal. It is actually a nice canal, cuts right through some really nice hills. Ends in Reading which makes it easy to get home to anywhere. Claire Shelley and I had recced this part of the route a few weeks before and thought it was fairly easy going but the runners were finding it much harder and I got two phone calls from Ben and Sam wondering whether they had gone too far. Obviouslt I could say they have already gone too far by entering this race. Idea for next year - The "Roll of cellotape race" - People just run around and around looking for the end that is really difficult to find. It was clear now that a big gap was opening up, we waited for about 2 hours before Terrence came through. He was looking strong and was now opening up a bit of a gap on Sam and Ben who came through fairly close together. Sam stopped for a while to have a snooze in the van while Terrance and Ben cracked on. Sam left the van and went on not long before the cheery trio came along, bursting from the seams with snickers bars. Richard now had eaten 12 and Tom had thrown up a few times on the last stretch. Steve was looking on top of the world though, almost as if he were enjoying it. They hung around in the van a little while warming up as I congratulated them on making it as far as the first sunrise. Dave had dropped out at the previous checkpoint having been timed out and we were now only waiting for Kate and Chris. It was approaching 8am which was the cut-off for this stage but we did not want to pull them out if they looked like they could still carry on. I was looking on facebook and saw Chris was positng photos of Thatcham station which I knew was only 2 miles away. Kate also posted about wanting hot food so I asked Duncan to go to a garage and get some pot noodles. They arrived just after 8 and I watched Chris enjoy the first pot noodle of his life. How can someone get to (however old he is) without having a pot noodle? Anyway we chatted briefly but they had to leave to make the cut off for the next point which was Reading where the canal hit the River Thames. Jany had gone ahead with Rob who left early and was replaced by my lovely wife Gemma who is always keen to help me out on this kind of thing. Earlier I had found out that she was the most awesome wife in the world for getting Monty Python Tickets. Idea for next year. Runner are only allowed to run in one shoe. Even the barefoot ones. Tim had already gone through Reading and was on his way to Streatley. I thought about Ben's map. After 80 odd miles of running it might actually be of use now. We packed the checkpoint off and I said bye to Duncan who had been brilliant in standing about in the middle of nowhere to help further the cause of pointlessness. Paul Ali had gone about 4am (he said he could only stay till 1 but I think he had difficulty pulling himself away). Volunteering at ultras is a bit like binge drinking. You stay out all night, can't really remember the conversations you have with people you barely know. You roll in at the early hours of the morning, stinking of someone elses body fluid and a mouth that tastes like a badgers arse. The dehydration you get from eating only crisps for 12 hours gives you a massive hangover. You are possibly epically constipated from not being able to go for a crap anywhere and at least some of the time there might be a random girl sleeping on your sofa. We drove to Streatley but not in time for Tim who went straight through without stopping for his drop bag, which wasn't there it was with us. The plan was now that the runners should head along the Ridgeway path on the same course as the Winter 100 runners do for miles 25-37. No one from the 100 mile run was on the course yet. We did not know exactly when a POS runner might end up at Streatley and estimated that that it would be much later than this. It was our intention that the runners will mix in with the W100 runners however Tim was way ahead of this projection. Chris was enjoying the race but reallty wanted to "phone home"
We decided to have a social media blackout on updates now as the runners were so far apart. AN update saying that Tim was over 100 miles would give an indication to those who were 90 miles in that there was a lot more to go. I hung around Streatley until the 100 miler had started with the intention of then heading straight off to Swincombe where the next CP for the POS was. The runners had run 104 miles back from Bath to the start and now it was time to start messing with them. The Swincombe CP was due to open about 2 for the leaders of the W100 however Tim was due to get there about 11. Just before I left I got a message to say that he had spoken to James and had to drop out because he twisted his ankle. This was devastating, he was absolutely flying through it and it was so unlucky. We managed to pick him up before too long. He was a really gentleman about it, sending me a message saying "I've come a cropper on the trail and can't run anymore". Tim was taken straight back to his hotel which means I didn't see he. It would have been good to say well done and unlucky however it was probably an advantage as Terrence had just arrived at Streatley and we weren't sure whether we should say that he was now winning or not. I said the truth (that the leader went through a couple of hours ago) and said the same to Ben who appeared a little later. We could tell all of them that they are winning - suggested Robbie. This was a great idea but I'm not very good at lying to people and would give it away somehow. Around this time Kate was picked up from near Reading as she had to drop. She had stuggled valiantly with illness and I didn't realise until we spoke at the end how new to all this she was, and she has run the GUCR and the Thames Ring. That is quite an impressive list of ultras to finish in your first years. Chris was continuing to Streatley. So Gemma and I headed over to Swincombe (via a take away curry) where the checkpoint were expecting either the leader of the Piece of String race or Ed Catmur, the leader of the Winter 100 who was setting a lightning pace. I had to get to the checkpoint and make it clear to the guys there what was happening. If a runner is from the Winter 100 then they get sent back where they came. If they are from the POS race then they are to carry on along the Ridgeway. They should be easy to tell apart, the POS runners will be going a lot slower and look absolutely f****d.
Or would they? Did the runners get directed correctly? Was the whole Winter 100 race field set off wrongly to Ivinghoe Beacon? How many more miles did Sam Robson to to everyone else? Is this the end of the Piece of String report? Find out in the next installment of what is a shameless attempt to just get more hits on my blog.